Tonight was Skating Boot Camp night, so I had a little snack after work to fuel me through – it’s never fun working out when you want to gnaw your arm off! A sliced granny smith apple, heated in the microwave, with some Peanut Butter & Co. Cinnamon Raisin Swirl. 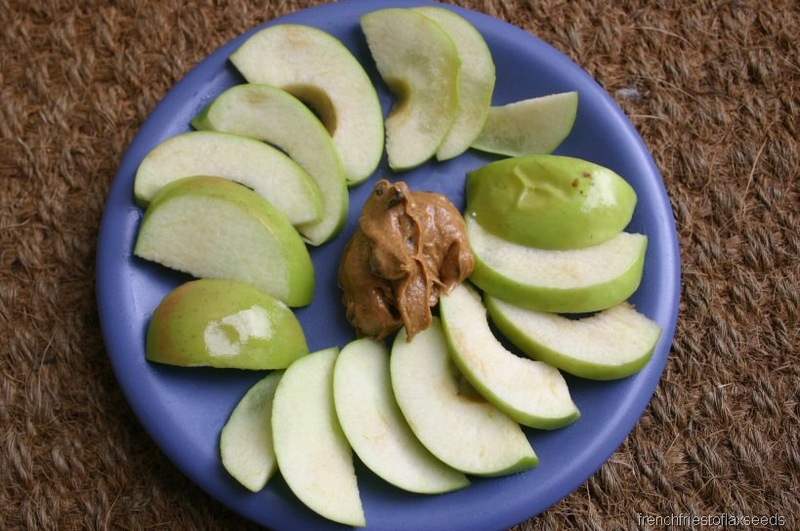 This peanut butter was made for apples. Boot camp was great. The weather cooperated, and it was pretty sunny for most of it – considering we had full on rain earlier in the day, I was happy. It was your choice of running, roller blading, or biking. I picked biking, and had a great ride down to our meeting location, along the trail, and back home. One of the girls often bikes out to one of our other meeting locations, and says it’s about 45 min to get there from downtown. I’m considering trying it out next Boot Camp – why not add a little more to the work out and save on gas? 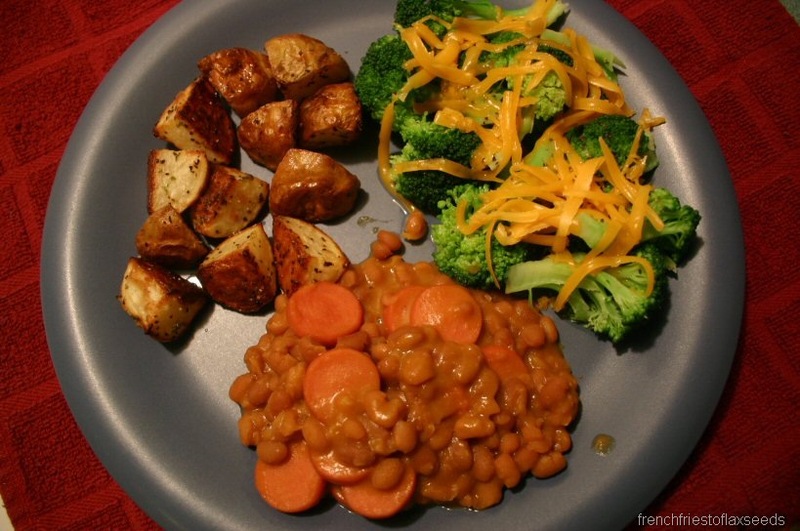 I knew exactly what I was making for dinner when I got home – beans! I’ve been having a bean craving lately, and have definitely been eyeing up recipes for various bean dishes that I may just have to try out in the near future. Tonight’s beans weren’t anything fancy though – I went with the classic wieners & beans. I mixed up a can of baked beans with some turkey dogs and lots of dry mustard. My mom always made them this way. I really enjoy the bite from the mustard in contrast to the sweetness of the molasses in the beans. Awesome! 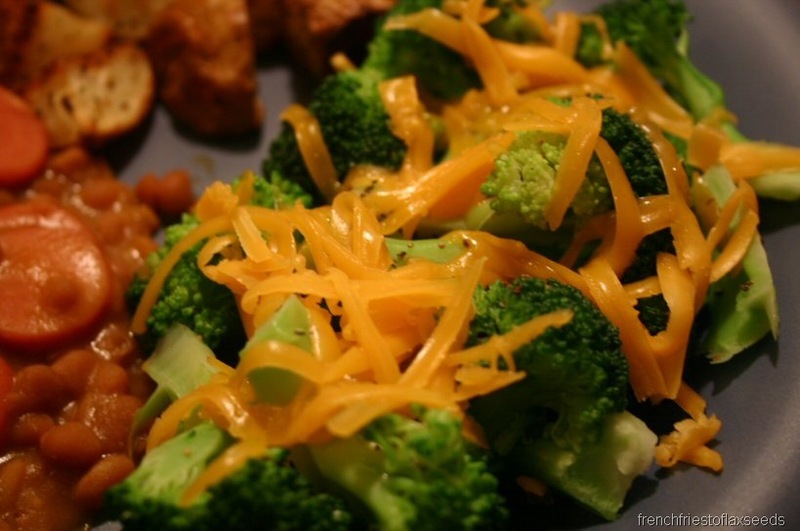 I also steamed up some broccoli, and topped it with cheddar cheese. What can I say, I love me some cheesy broccoli! And a few roasted potatoes to complete the meal. Hence why cooking dinner took so long – I didn’t eat until after 9 pm! 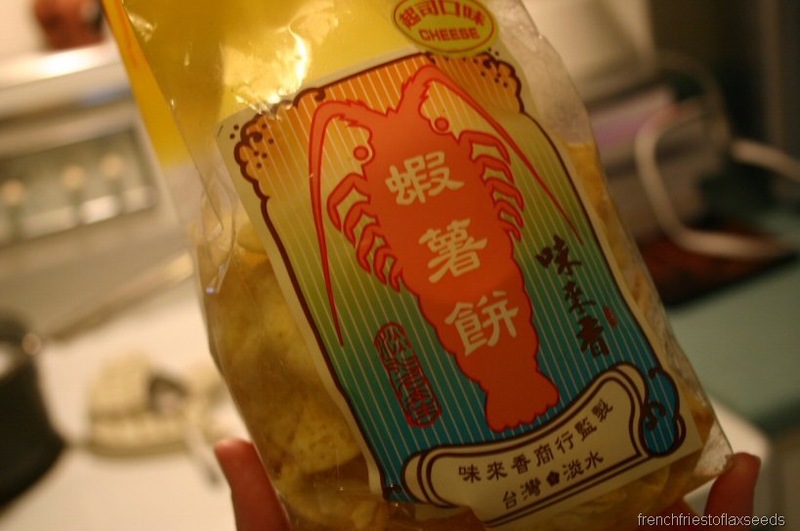 While I was cooking dinner, I figured I’d try out those crazy shrimp chips my friend brought back from Taiwan. Something else I tried out with dinner was this soda I picked up at Whole Foods on the weekend. 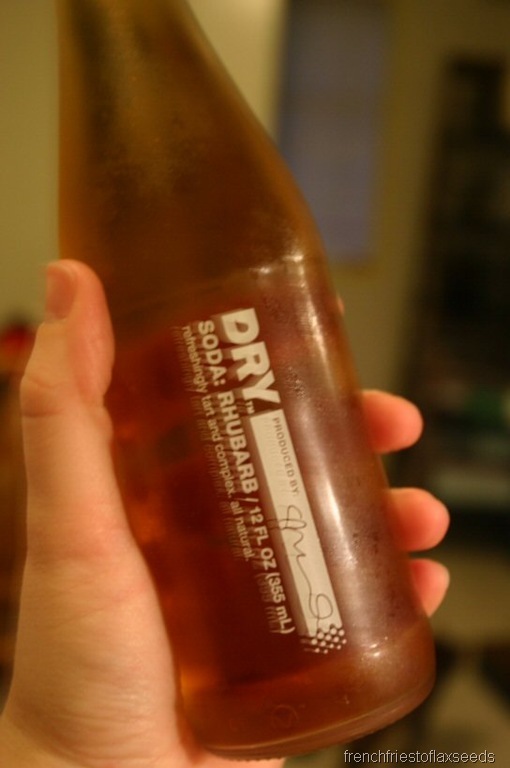 Dry Soda Co. Rhubarb Soda. You bet it was the rhubarb that caught my eye while shopping. They have a few other flavours – I also picked up the vanilla bean one. I wasn’t sure what to expect at all from this soda. At first sip, I thought it was very green tasting, almost grassy. But I found as I drank more of it, I got more of that rhubarb flavour. I wish it was a little tarter, as that’s what I love about rhubarb. But make no mistake – this is not a sweet soda. Each bottle only has 60 calories, so it’s not loaded with sugars like alot of drinks out there. And it’s made with all natural ingredients – gotta like that! I would totally buy it again, and want to try out the other flavours. Too bad they are on the pricey side – $1.99 each, or a pack of 4 for $7-ish? Love weenies and beanies! I haven’t had them for ages it seems. That soda sure sounds interesting. I can see how the rhubarb woulda caught your eye! Rhubarb soda? I’ve never seen that! Glad you went with biking – that would have been my choice as well! By the way, I was watching House Hunters International last night and they were in Vancouver. Made me think of you! I love the old school looking soda bottles you sometimes find in Whole Foods. That Rhubarb soda sounds interesting. I have actually no clue what rhubarb tastes like so I think I need to try it again. Biking would have been my choice, but roller blading sounds awesome! I haven’t done that in so long! Have a great day at work. Yum!!! I love love love baked beans with weiners. 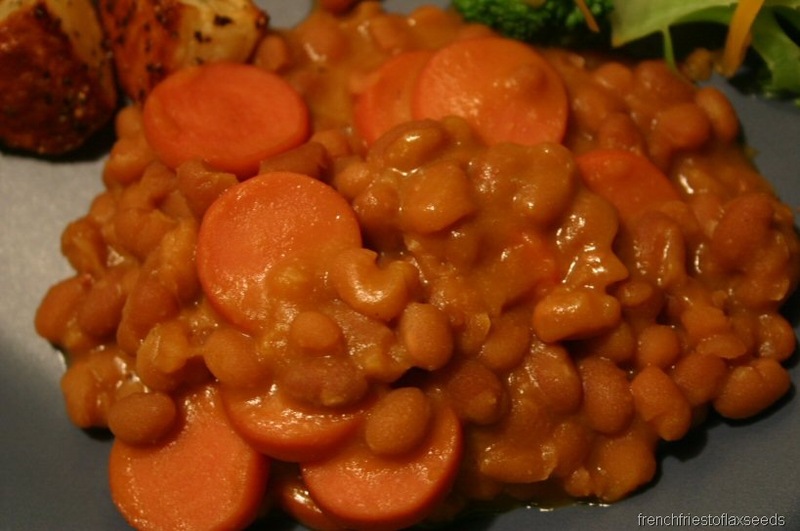 Sometimes I add the tofu weiners, since with baked beans it’s really hard to notice the difference in taste! The rhubarb soda sounds intriguing. … I don’t know if I like rhubarb or not, I’ve only had rhubarb pie!! It was good, but what pie isn’t good??! quirky asian food is the best, aint it?! Yay for beanie wienies! I made a veg version a few months ago–delish. Good blog post, I will be sure to bookmark this in my Furl account. Have a good day.